What is the COUPDAYBS Function? The COUPDAYBS Function is categorized under Financial functionsFunctionsList of the most important Excel functions for financial analysts. This cheat sheet covers 100s of functions that are critical to know as an Excel analyst. It helps calculate the number of days from the start of a coupon’s period until the settlement date. Coupon bonds are bondsMarketable SecuritiesMarketable securities are unrestricted short-term financial instruments that are issued either for equity securities or for debt securities of a publicly listed company. The issuing company creates these instruments for the express purpose of raising funds to further finance business activities and expansion. that pay interest before maturity. To know the number of days until the next payment, we can use the COUPDAYSBS function. Using the function, we get the number of days from the beginning of a coupon period until its settlement date. Settlement (required argument) – It is the settlement date of a given security. It is the date after the security is traded to the buyer. Maturity (required argument) – It is the date when the security expires. Frequency (required argument) – It is the number of coupon payments per year. The argument can take a value of 1 (annual payment), 2 (semi-annual payments), or 4 (quarterly payments). The function will default to zero when omitted. It indicates that the days in the month are counted using the US 30-day method with a 360-day year. When we enter 1 as the basis, the function uses the actual number of days in the month and year. Whereas, when we enter 2, it will count the actual days in the month with a 360-day year while 3 will assume a 365-day year. When we enter 4 as the basis, it is same as 1 except that it uses the European 30-day method. 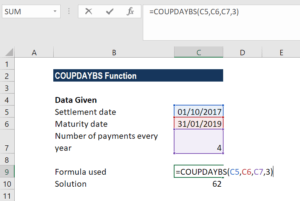 How to use the COUPDAYBS Function in Excel? Additionally, we are told that 4 payments are made per year. Using the formula =COUPDAYBS(C5,C6,C7,3), we get the result 62 as the result. We used the Actual/365 as count days. As we need to find the number of days using the function, we need to first convert the dates given into text format. The formula to be used would be =COUPDAYBS(DATE(2017,1,1),DATE(2022,2,15),1,2). The result we get here is 321. Excel first converted the dates into text format into proper dates and then calculated the number of days. Here, we used 1 as frequency and 2 as basis. When the settlement date is greater than or equal to (≥) the maturity date. When the frequency argument provided by the user is not equal to 1, 2 or 4. When the given basis argument is a number other than 0, 1, 2, 3 or 4. Any of the arguments given is non-numeric. The COUPDAYBS function truncates all arguments to Integers.